Aerosol particles reflect sunlight. There are fewer aerosols in the atmosphere now, so that's why the planet is warming. Aerosol pollution impacts our climate over the short term. Carbon pollution is the main culprit over the long term. The main cause of the climate change we’re seeing now is carbon pollution, which we put into the air when we burn dirty energy like oil and coal. But carbon dioxide and other greenhouse gases aren’t the only air pollution released by human activities. For example, the harmful haze you see and breathe in big cities like Los Angeles or Philadelphia is made of “aerosols," a name for various kinds of tiny particles in the atmosphere. Carbon pollution traps heat and causes warming, but aerosol pollution in haze reflects sunlight. This temporarily masks some of the warming we would otherwise see due to carbon pollution. Thankfully, the U.S. and many other countries around the world have worked to reduce haze-forming aerosol pollution, and we can all breathe a little easier. But this also means the slight cooling effect of aerosols is reduced, and the world is a little warmer as a result. Here's what's important: It's carbon pollution, not aerosols, that is steadily warming our planet. Atmospheric aerosols are microscopic particles suspended in the Earth's atmosphere, which generally act to cool the climate by reflecting sunlight back to space and also by affecting clouds. The net impact of human activities, including greenhouse gases and aerosols, has been to warm the world's climate. The Earth's atmosphere is made up of a number of components. These include gases such as nitrogen, oxygen and water vapor, and also atmospheric aerosols. Atmospheric aerosols are microscopic particles that are emitted from human and natural sources. The aerosols become suspended in the atmosphere. Human sources of aerosols include industrial aerosols from emissions of gases such as sulfur and nitrogen oxides, as well as direct emissions of smoke and soot from fossil fuel and biomass burning. They can directly reflect sunlight back away from the Earth. They can interact with clouds in complex ways leading to changes in cloud reflectivity, cloud lifetime, cloud height and cloud precipitation. 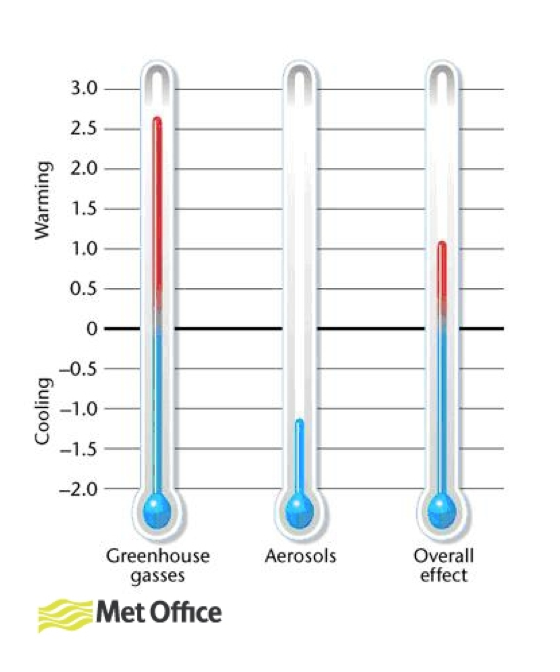 Figure 1: The impact of atmospheric aerosols on Earth’s climate. Click here to view the full size image. Human activities have increased concentrations of atmospheric aerosols, which has led to an associated cooling of climate. This cooling acts to counterbalance some of the warming from increased concentrations of greenhouse gases, which is also caused by human activities. Just how much of a cooling effect these aerosols have on the climate is still uncertain owing to the complexity of the problem. The Intergovernmental Panel on Climate Change’s Fourth Assessment Report went some way to assessing this. It concluded that, although these microscopic particles do act to cool the climate, they do not offset the global warming effect of greenhouse gases (Figure 2). Figure 2. The warming associated with greenhouse gases, the cooling associated with aerosols, and their effect on climate. A common misconception about aerosols is that they come from spray canisters, used for products such as deodorant, and that they damage the ozone layer. In the past the gases used as propellants in spray cans were damaging to the ozone layer. Under the Montreal Protocol, these propellants have been replaced by non-ozone depleting substitutes. However, these gas replacements are greenhouse gases and add a small component to the global warming problem. Adapted from original article by Dr. Jim Haywood, Aerosol Research Manager for the Met Office. Crown Copyright. Contains public sector information licensed under the Open Government Licence v1.0.